You can wish for a successful marriage until the palm fronds turn to icicles on Oahu. The reality is “happy ever after” does not happen unless both partners put forth the necessary effort to make it happen. 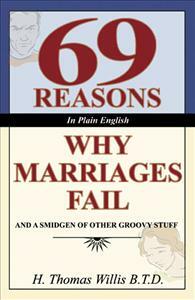 Based upon the tried and proven notion that prevention is easier than the cure, 69 REASONS WHY MARRIAGES FAIL is a candid examination of some of the enigmas of bad marriage and divorce which are so prevalent in these times. It brings to light the reality that there is so much more matrimonial mates can do to preclude their marriage ending in a whole lot of heartache and in most cases, the ultimate consequence which is divorce.